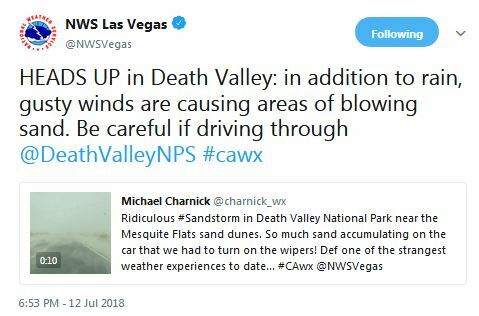 Recent Death Valley weather problems? Have any of you been in the park lately or know if the recent storms caused any damage or problems? Hoping not! Maybe you've read all this. I haven't been keeping this updated. 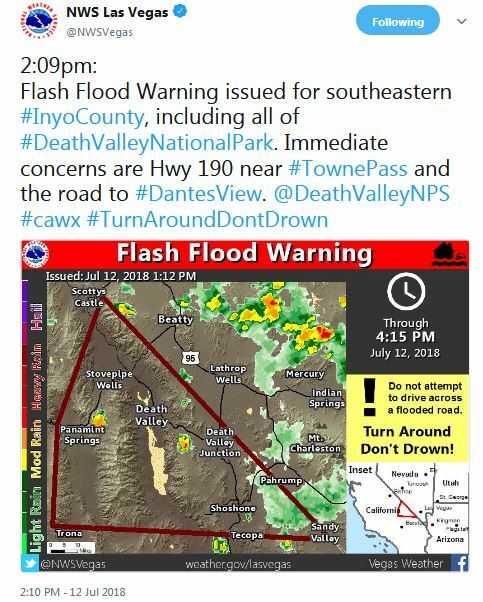 But July 19 there was a flash flood warning in the evening, for an area mostly comprised of the Cottonwood Mountains north of Ubehebe Crater and south of the DV-Big Pine Road. 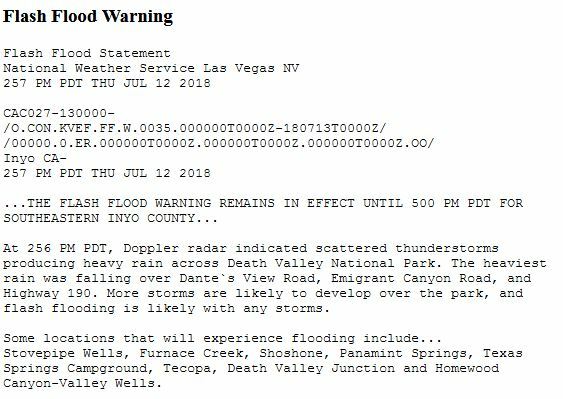 Then this afternoon there was a flood advisory for western areas of the Park. 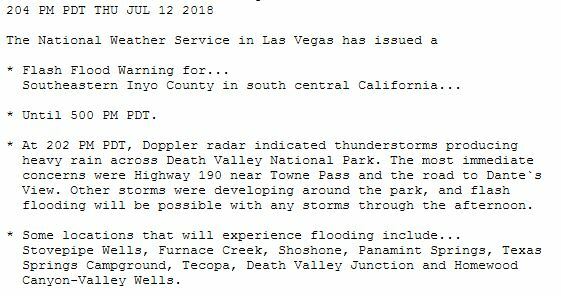 Mostly the Panamint Mountains, and also west of Panamint Springs. 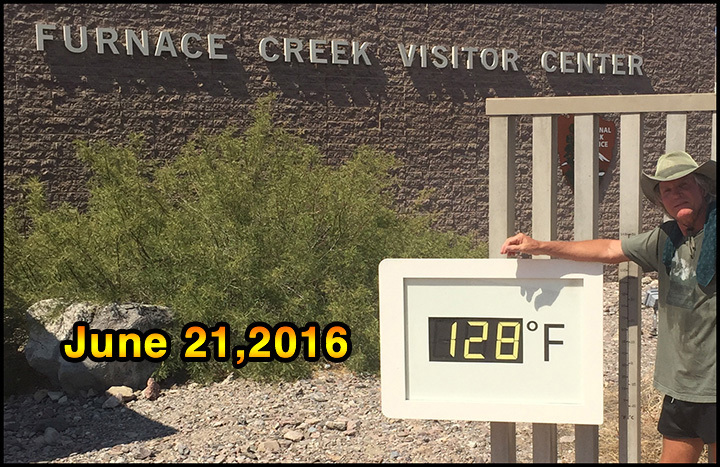 Before the monsoon season started, I read a forecast that called for above-average monsoon precipitation in the Southwest. May turn out to be correct! Updated: Officially it got up to 127 !! 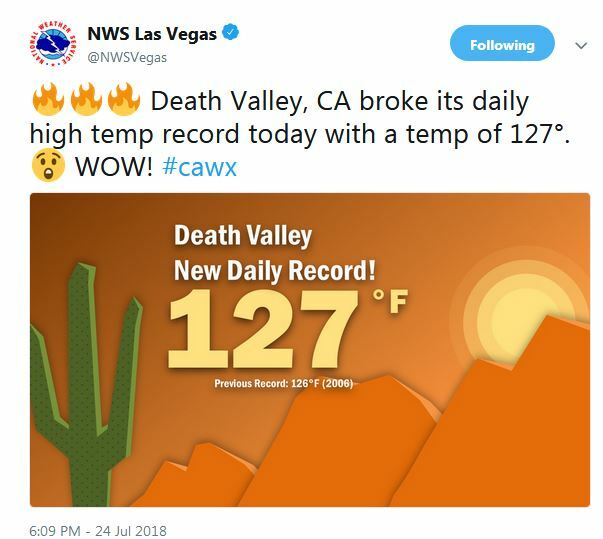 Not to pour cold water on a hot topic, but here's photo proof of higher temps. 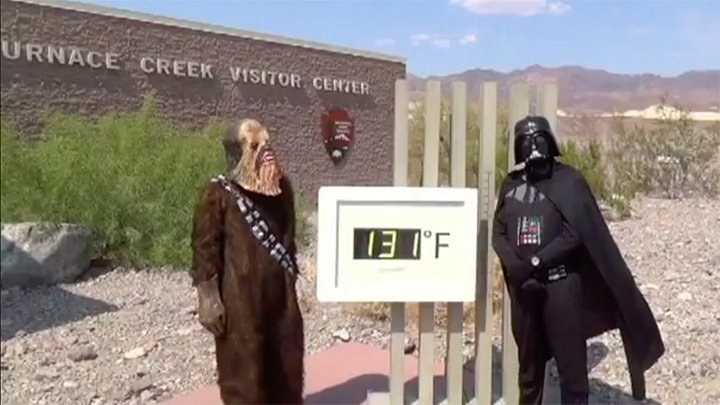 Maybe the thermometer at Furnace Creek Visitors Center is not official. I know I'm getting nitpicky here even if it's just a matter of degrees. and put that in your pipe and chew it Chewbacca! Yeah, that's not how it works. 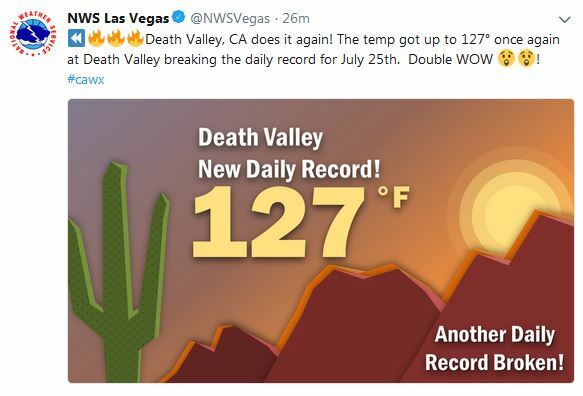 Based on my own past observations, and discussion here, that readout isn't connected to the "official" WX station there in FC. Seems like it would be easy enough to do! 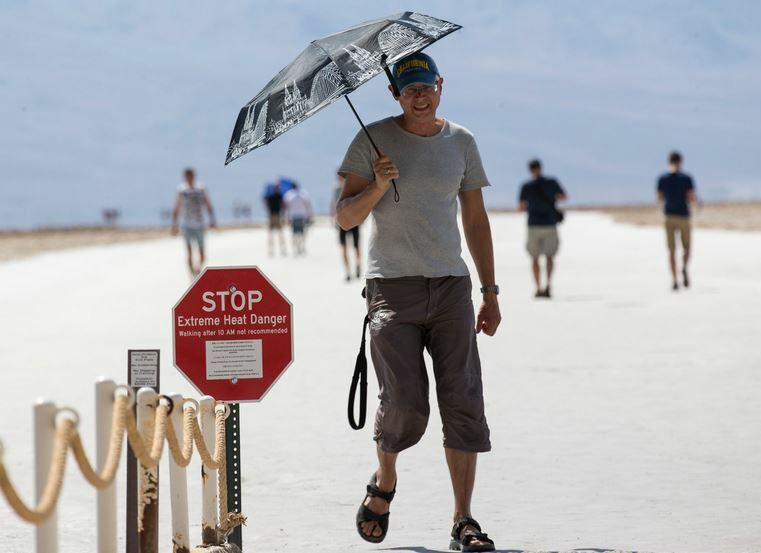 But apparently that's not stopping the tourists! Thanks for the timely update Candace. I have mixed feelings about hoping for a new record. 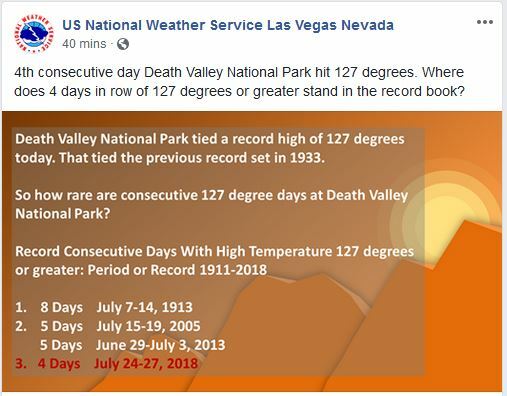 While it would be really "cool" to break the consecutive day and all-time high records just for fun, the reality behind the temp increases may be "bad news?"